My name is Juliana. I was born in Brazil but I consider myself a citizen of the world since I have had the chance to live in different countries like Chile, Switzerland, Kenya, and the USA. I completed my undergraduate studies in International Relations. I have a diverse professional background since I had the opportunity to work for different industries and companies such as Deloitte, Rio 2016 Organizing Committee of the Olympic and Paralympic Games, and Knowe, a Tech Startup. 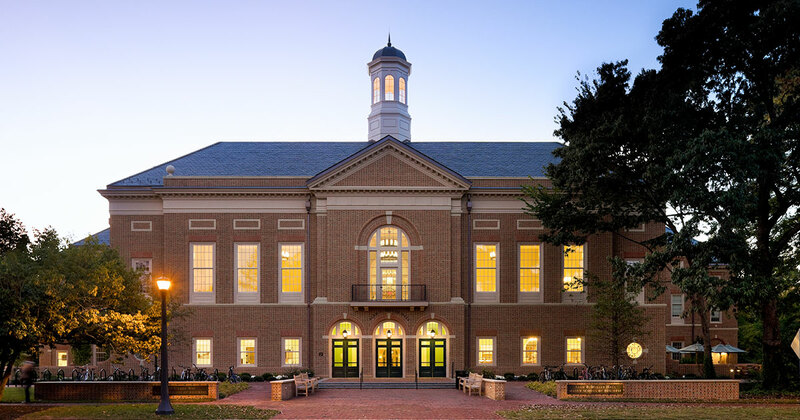 I would like to share my story of how I became an MBA candidate at William & Mary. It was May 2013. I received an online advertisement for an MBA fair that would take place in Rio de Janeiro, Brazil with schools from all over the world. I always wanted to do my MBA abroad. But I was committed to 3.5 years of working for Olympic and Paralympic Games Rio 2016, so I would have to wait a couple of years. Because of my curiosity, I decided to sign up and to learn more about the opportunities at the MBA fair for the future. Little did I know that this fair would change my life forever. During the fair, I had the chance to talk to schools from different countries. Suddenly, I saw a green booth with "W&M" in gold letters. It was the first time seeing that logo. I met this very friendly woman smiling at me and trying to say a few welcoming words in Portuguese with an adorable accent. I could feel her energy during the first minute of our conversation. She was Amanda Barth, the Admissions Director of William & Mary's full-time MBA program. At that fair, I had the chance to learn more about the school and talk to alumni. That day I started to think that William & Mary could be a perfect fit for me after the Games. I stayed in touch with Amanda during the following years while many things changed in my life. I finished my work at the Olympic and Paralympic Games and got married to Gustavo, the most incredible guy I know. Now it would be two candidates joining the MBA adventure. We organized our finances, since it would be 2 years without a salary for both of us, and decided to visit the campus before applying. The minute we walked in, we fell in love with the place. If you visit the campus, you know exactly what I am talking about. The city, the school, the people... everything felt right for us. We came back home to apply for the GMAT, TOEFL and prepare for the application process. However, a few weeks after our tour in Williamsburg, I got in an accident and had to go for emergency surgery and stay almost 4 months in a wheelchair. It was not the most pleasant experience but again life gave me the chance to build more resilience. I had to study from the hospital while taking heavy medicines. I must admit that the idea of quitting the MBA process crossed my mind many times. I was lucky to have my family taking care of me and Gustavo, who always supported me and helped me to study for the exams. From the other hemisphere, I had Amanda encouraging and motivating me to keep this journey going. I will be forever grateful. Because of them, I was admitted to great business schools. I chose William & Mary because they deeply cared about me, shared the same ethical values and like me, wanted to make the world a better place. Gustavo and I got officially married in June of 2018 in San Andres, Colombia. In July, we sold everything we had in Sao Paulo, Brazil. In August, we moved to Williamsburg, Virginia, USA. We went from a city of 20 million people to a community of twenty thousand - our first cultural shock. The city was much smaller than what we were used to but we were in love with every single part of it including the school and the MBA Program. Being on this adventure with my best friend has made this experience even more incredible. Especially because he was an Economics major and is very talented with numbers. There is a lot of diversity in our class - 40% international students and 20% military. I’ve had the chance to experience the Diwali Celebration from India and Thanksgiving from the USA. I’ve cooked “Feijoada”, the traditional Brazilian dish, for my classmates. And in the next few weeks, I am going to the Asian Lunar Year celebration. There are a lot of activities and clubs at school and the hardest part is choosing which one you want to join. I am currently the first-year representative of the Net Impact Club, which promotes sustainability with the three pillars of environment, society, and economy. I was also part of the team that suggested disruptive trends in the automotive industry to the former CEO of GM. We did a business analysis to decrease single-use plastic all over Miller Hall. We are doing a partnership with the local winery to show how sustainability can help business. Soon I will be joining a hackathon, even though I have no idea how to code. Wow! Looking back, I can understand why I’ve so busy during these last few months. So far, my favorite part of the MBA experience is the people I’ve met. They have different backgrounds, cultures, and experiences than me. I am very lucky to have an amazing learning team, brilliant executive partners and great classmates. They are inspiring me to think outside the box and see from new perspectives. I even created something that I call “Coffee and Learn”, where every week I invite someone for a coffee so I can learn something from them. It’s my great excuse to invite people to chat and get a good cappuccino. It has been a long journey since I met my dearest Amanda in 2013, but every single minute of it has been worth it. I came to William & Mary’s full-time MBA program to not only improve my technical skills, but to develop myself as a leader. I want to be an empathetic, change-maker, and an innovative, brave and resilient leader. Thanks, William & Mary for helping me on this mission!